Café Life | reading interrupted. 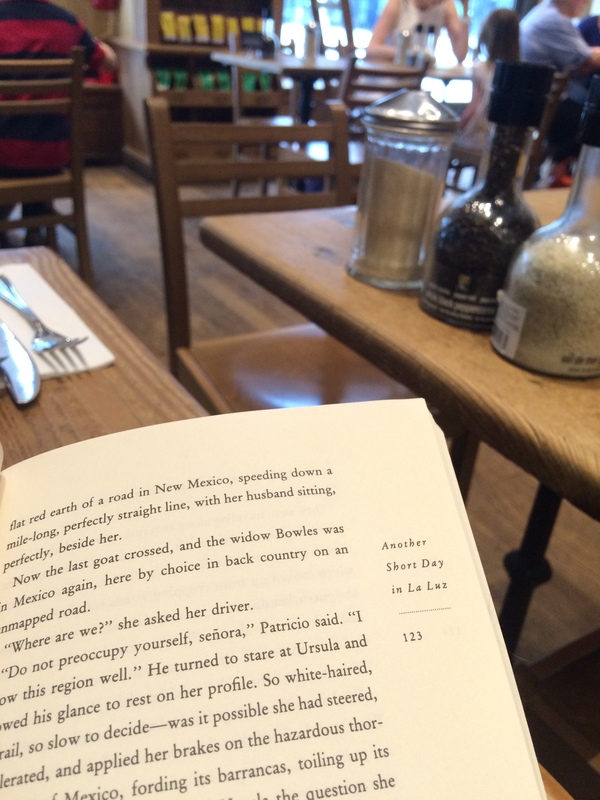 There’s something special about reading in a café. Your reading is interrupted, yes, but pleasurably so. The clanks and whooshes of the kitchen, the murmurs and laughter of the people around you, the background music, and the beeps of the passing cars. They all create a soundtrack to your reading experience. Your rhythm is off its normal course as your gaze catches the sight of a dog being pushed in a stroller in the street. But, in the end, having a book as company in a café is a lovely experience. This entry was posted in books and reading and tagged books, café, cafe life, conversation, reading by Letizia. Bookmark the permalink. That’s true, Roy. Listening in on other people’s conversations in cafes could lead to many interesting stories! I love reading, no matter where I am. If I can steal a moment to read, I usually will. The same experience of reading at a coffee is one that you can get reading at the mall. A lot of them have these comfy chair areas at main thoroughfares. I’ve never read in a mall but, like you, love reading everywhere. It’s good to always have a book handy as you never know when you can have a few moments to read a chapter! Chaotic hum, that’s the perfect phrase! Half a book in two sessions today. Two cafe reading sessions, I love it! I could not read in a cafe but love the idea. It makes me feel like Sartre in St Germain…..
It’s hard not to be a snoop, isn’t it? And if I can’t listen in, then I try to imagine who the people are, what their stories are. And I’m not even a fiction writer! You captured the experience perfectly – enjoyable distraction! Yes, I’m not sure how much reading we actually get done but that’s ok! There’s something about reading in public, isn’t there, Dannie? At once, communal and yet very private. Thanks for the tweet share. I hope you’re been well! Totally agreed! I love writing in cafes too – at least then those tantalising overheard phrases sometimes work their way in to dialogue! I know what you mean, when one writes at home the house suddenly becomes very clean, doesn’t it? The buzz of a cafe does make a good background as long as it’s a buzz. Almost like white noise. It sounds a lovely experience. Have you read passages about cafes when you are in a cafe? That might be a curious experience. Yes, that would be very cool! I like that you are not only inspired by the snippets of conversation but by people’s style choices! Next time I see someone writing in a cafe, I will be more aware of whether or not they are looking at my outfit, haha! Or eavesdropping on your conversation! 😉 It’s a great place to pick up dialogue ideas. It really is a wonderful feeling to read in a café, it is strange that being put off is so pleasing when normally it is infuriating. Now that the weather will turn, it will be a pleasure to hear the clinking rather than the wooshing of the wind on the trees. It’s one of the reading distractions that we welcome, funny how that works! I wish I could read and write in cafes without being distracted. But I’m too much of a people watcher, methinks! It’s a delicate balance, not being distracted by other’s conversations but still listening in! Love, love, love this! Afraid I don’t read in public as much as I used to, but I do love working in cafes on my remote days for all the reasons you listed. A welcome distraction can be just the right energy to keep you going, especially in my neighborhood. Lots of puppies around! Writing on the train must be interesting as well, with all those distractions, noises, people and views to look at. I like to read on the train for just those reasons! I love reading in cafes! I don’t do it as much as I like, as most of the time I’d be with company, but it’s so nice when I get the chance. There are a number of cafes around my house that are rather quiet during weekends, and I manage to get a good chunk of reading (and sometimes writing) done! Yes, one has to be alone or with someone else who is reading or writing, it’s true. I always have a book with me (I’m sure you are the same) so if someone I am meeting is late, then I can get some reading done! Letizia I have an image of a dog in a stroller, too funny. It is a rare occasion for me to sit in a cafe and read, but when I get the chance I, like you, struggle to focus because I love watching people, something I have done since I was a little girl. Don’t know why? I imagine their stories and my mind wanders far away I guess. Just like when I read. A dog in a stroller is always a surprising and fun sight – I think it’s because I anticipate a baby in the stroller and then see a furry face with its long tongue hanging out,haha! Reading Proust in a cafe sounds wonderful! I agree completely! Plus, having your book open, the way you do in the picture, let’s you travel back and forth between the snippets of the world around you and the world inside the pages. Almost as if the two things are going on simultaneously. So true, one travels form the story to the cafe and then back to the story again – it’s part of the joy! A soundtrack to the reading experience.. yes! I know people that cannot stand interruptions when they are reading though 😉 I’ll have to send them this post, hehe! There’s something about the distractions, isn’t there? And the coffee, hehe. Thanks for dropping by. I’m happy to see the page is open to something about goats! I’ve missed you guys – hope your summer was filled with lots of fun and great books. Now it’s already time for the cozy fireside reading. I think readers are the most excited about Autumn as it means cozy reading time. Hope you’ve been well, Sheila! Well described! I’m used to working from cafes almost daily, which involves a lot of reading and writing. And the strange kinds of interruptions in cafes are comforting and disturbing at the same time. But as you said, with books as your company, little can bother beyond a point. I recently wrote a haiku on this experience (https://avanip.wordpress.com/2016/10/11/haiku-29/) that has a similar feel to it. Also, I love the overall feel of your blog. I’m glad I stumbled across it while scouting for fellow book lovers. Good day! Your haiku and my post go so well together! I love this. I love those interruptions too. In a world where we are often in our own isolated units – a home, an office, a car – it can be so wonderful to find ourselves in the midst of engaging life, while at the same time enjoying our own private engaging world. The cafe I go to sells tea for 1.50 so it’s not at all expensive for a few hours of golden joy. Thank you. “in the midst of engaging life” – so well put! It’s important to not isolate ourselves too much and a cafe is a good place to be. Thank you for visiting and taking the time to comment (sorry I took a while to respond, the comment went into my spam file for some reason!). Wishing you a peaceful holiday season.